Get rid of your Achilles Tendonitis forever! Each morning when you get out of bed and take your first step you are reminded of your aching Achilles’ tendon. You limp away to make your first cup of coffee and you feel like an old man. There will probably not be any running today either. Race day is getting closer and closer and you are loosing valuable preparation time due to your aching Achilles’ tendon. Give me 5 minutes, twice a day for three weeks and I guarantee that you are on your way to get better. After three months you have solved your problem forever. I will give you detailed instructions with pictures on how to solve your problem. I will tell you how your Achilles will feel after you have performed the program and how you should react on the resulting effects of the exercises. Your problems might come back. No worries. Start the program again and the pain is gone. Just knowing that you have a tool that fixes your problem is a great relief. If you encounter pain during your weekend long run or during a tough tennis game it’s good to know that you have a solution that will take away the pain. That alone is sometimes enough in order to solve the problem. My name is Lars Henriksson. 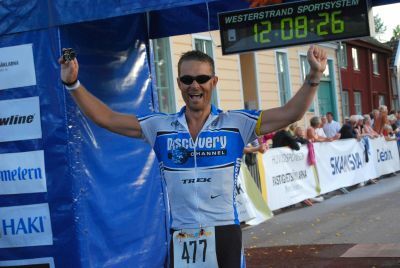 I’m a double Ironman Finisher and I’ve cycled through Sweden (2150 km) in seven days and nineteen hours. That’s almost 300 km a day for seven consecutive days. I’m male and 45 years old. Most Achilles’ tendon problems occur around men above the age of 35. I went into regular training when I was 35 and I immediately got problems with my Achilles’ tendon probably due to a heavy pronation. I tried different shoes, an extra sole for extra support, but it was not until I found this program, within the Swedish health care system, I got long term relief. The program is easy to use, it’s clear and straightforward with text and pictures. It gives you short instruction showing you exactly how to do the exercises. With right performed training according to the program during at least 3 months more than 80 % of the patients are satisfied and back to their former level of activity. Surgery because of pain in the Achilles’ tendon was previous common but since the introduction of this training program the need for surgery has decreased considerable. 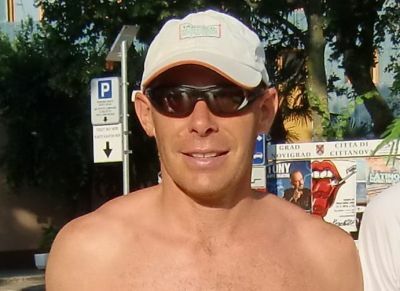 I’m a heavy runner, 100 kg, and I’ve had problems with my Achilles since I moved over from cross country skiing in the winter to running in the summer. 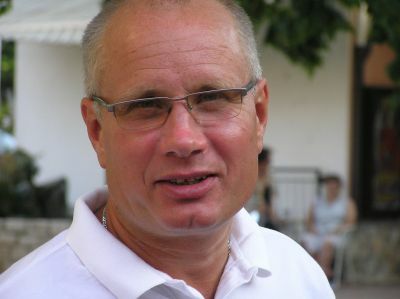 The exercises in the document provided by Lars Henriksson have helped me to cure the problem. Ola Hansson, Vice President at Kemira, living in Lund, Sweden says. Lars gave me a free copy of the document and asked me for feedback. I’ve had problems with my Achilles for a long while and it’s stopped me from reaching my full potential. 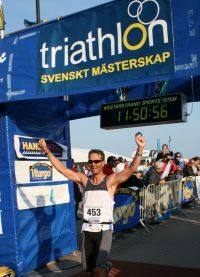 After following the easy and detailed instructions I managed to set a personal record of 43 minutes and 20 seconds in a local 10k race (Lundaloppet 2010). I can truly recommend the document. It is short with detailed easy instructions with pictures. You can't go wrong. You can do the excersises everywhere. In the morning, just stepping out of bed. At the bus stop waiting for the bus, you name it. No risks involved. If it don't work for you, you will get your money back. No questions asked. It only takes five minutes, twice a day. You will see improvements within three weeks. Physio Therapy is boring. You really need to believe in it in order to hang in. My program works. Trust me. Avoid surgery. Treat it befor it gets chronical. I personally guarantee if you make a diligent effort to use the techniques and exercises in this program, you'll see significant results within three weeks. If you don't, I'll refund the entire cost of the program to you. To make it really easy for you I've prepared a link. Just click the "Money Back Guarantee" icon above, follow the steps and you'll have your money back. Start the "How to get rid of your Achilles' tendon problem forever!" today and make a change. Pay with VISA, Mastercard or PayPal. Don't waste another day of training. Give yourself a promise right now. Take action. Don't let your achilles tendonitis problem get chronical. Remember, surgery is always a risk and there is no 100% guarantee that it solves the problem. Take action. Decide in this very moment. You will solve your Achilles tendonitis problem! PS I would really appreciate to get the opportunity to help you in the same way as this program has helped me, my friends, colleagues and training partners. Join the crew who knows a secret around how to fix Achilles tendonitis.